Slip and fall accidents are one of the most common types of injuries suffered by Americans, and the majority of them happen in the home. Specifically, they tend to happen in the bathroom, where water from the shower or bathtub and slippery tile floors meet. In 2008 alone, 234,000 people in the U.S. over the age of 15 suffered a nonfatal injury in their bathroom, according to Health Monitor. If you’re looking for ways to improve shower safety in your home and prevent slip and fall accidents from happening to your family, here’s a list of protective steps you can take in your home bathroom. Bathroom floor mats are supposed to prevent slips and falls, but, believe it or not, they’re the most common cause of tumbles taken in the bathroom. Stepping on a floor mat from the wrong angle or losing your balance as you’re getting out of the tub can easily cause the mat to slip out from under you, suddenly changing it from a protection device to a liability and a threat to your physical wellbeing. Aside from getting rid of the floor mat altogether (which would lead to wet floors and yet another slip and fall hazard), the best way to keep floor mats from slipping is to secure them. This can be done easily by attaching double-sided tape to the bottom, which will cause the mat to stick to the floor and stay in place. Aside from putting a foot down on a floor mat at the wrong angle, the next most likely place to fall in the bathroom is in the shower/tub itself. To prevent slips and falls in a wet shower, the best thing to do is to add nonslip surfaces to the bottom. Nonslip shower flooring can be bought in strips, full surface mats, or even tiles. Choose whichever one works best for your shower. Another reliable slip and fall prevention method is to install a handrail or handlebar to the interior wall of the shower, providing support and security for getting in and out of the bathtub. If members of your family are elderly or disabled, shower rails are an especially useful accessory to have in your bathroom. If you don’t clean your bathtub regularly, the surface can become coated in soap scum, mold, and other filmy substances that only make it more slippery and dangerous. 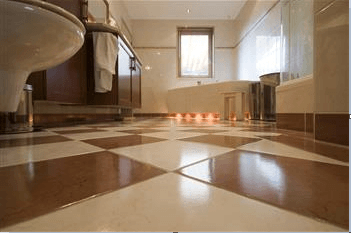 The same goes for the floor – if not cleaned regularly, a hard surface bathroom floor can become slippery with dirt, water, and other potential hazards. One of the most important ways to prevent slip and fall accidents in a home bathroom is simply to keep it clean. To learn more about American Bath Enterprise’s bathroom products or to place an order, contact us today at 888-228-4925.